Over the last 20 years Evan Holloway’s revisionist take on the modernist sculptural lexicon has become an indelible feature in the Los Angeles cultural imagination. He synthesizes compositional and conceptual rigor with a passion for handmade things, creating a body of work driven by intuition and the meanings resulting from the methods, restrictions, and possibilities of materials. His sculptures retain a democratic openness and accessibility even as they address specific art historical legacies and readily lend themselves to esoteric readings. Outdoor Sculpture is Holloway’s first exhibition to consist solely of objects conceived for outdoor installation. Though they require intensive planning and fabrication, the open-air settings for which they are intended are necessarily less predictable than white-walled galleries. Holloway thereby reimagines the ephemerality and provisional quality of his earlier work, which often included performative elements or unorthodox materials, in a more expansive register and at a larger scale. 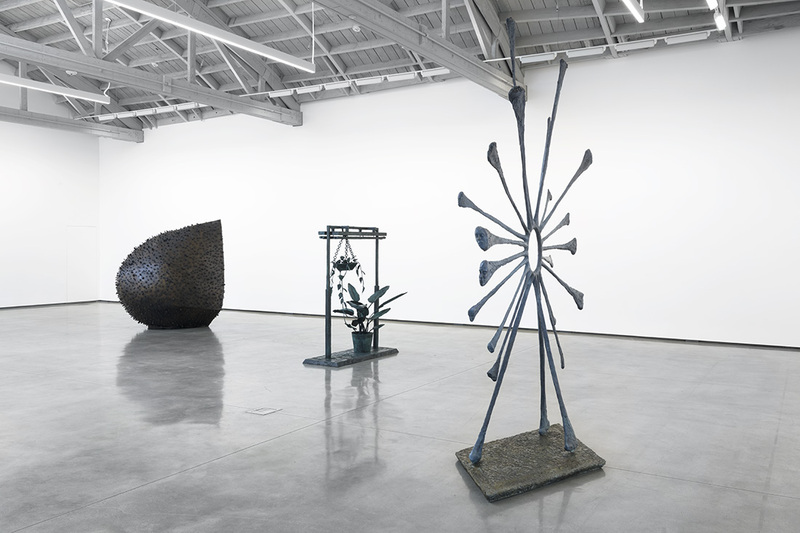 As he confronts technical issues of size, visibility, and durability that come along with the possibility of placing objects in the landscape, his forms have evolved in a variety of ways; the exhibition showcases a diverse range of sculptural languages, each of which addresses a different set of questions regarding form and signification. 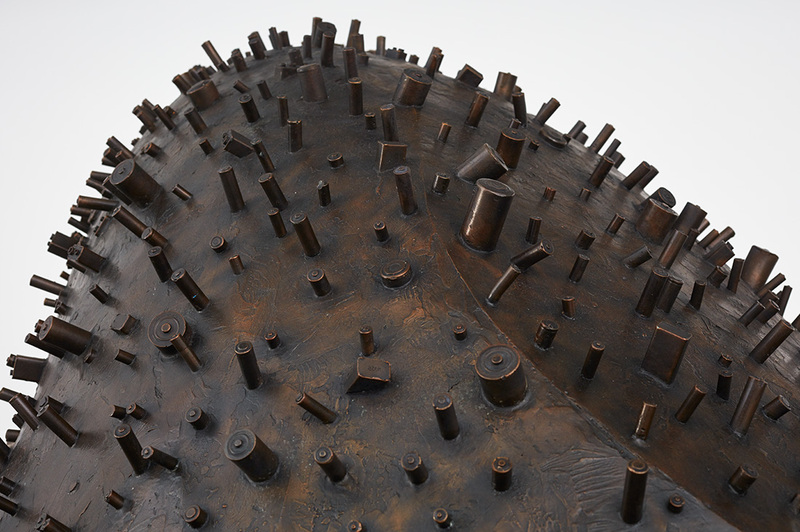 A large, bulbous bronze object studded with stout cylindrical appendages is a virtuosic exercise in volumetric form. Its organic overall mass is impossible to fix in the mind with a single glance, while the staccato rhythm of the appendages breaks down any read of its impressive scale into a more intimate kind of information. Complicating things further is the fact that the appendages are casts of spent batteries; while the batteries’ entropy would be a real and active element in any work that features them in their original state (as Holloway has used them in the past), here it is a negated but perversely memorialized decay. The notion of permanence gains new facets when simultaneously applied to a durable material, a monumental sculptural object, and the irreversibility of environmental destruction. 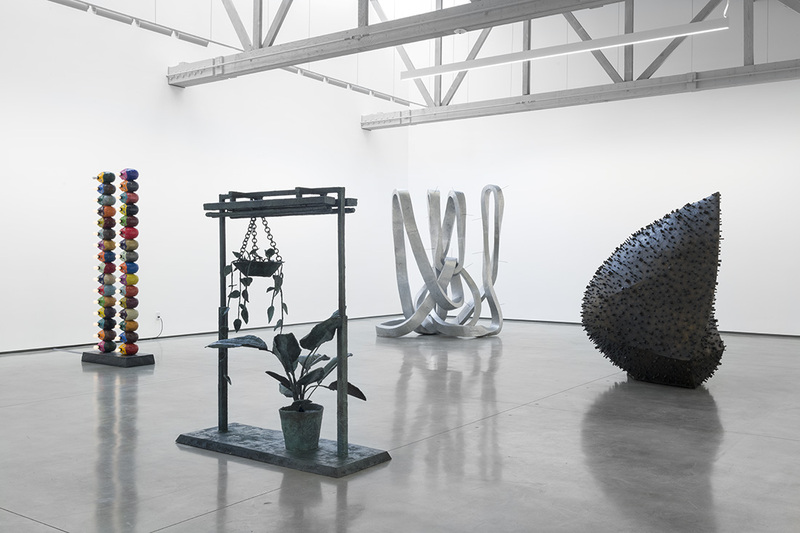 An altogether different set of compositional and conceptual concerns inform the intensely linear 28 Incense Sticks, the largest, most ambitious, and most intricate of the Möbius strip-inspired “loop” sculptures Holloway has made to date (the first plaster iteration was made in 2001). 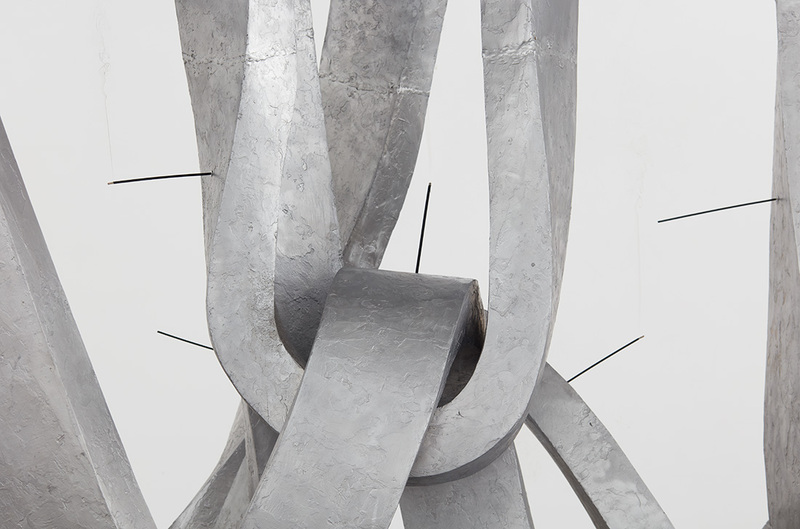 This cast aluminum version twists around and through itself, challenging attempts to figure out where it begins and ends. Like other works of its type it features an olfactory component. Twenty-eight small holes punctuate the work’s surface, all of which hold sticks of incense that, when lit, appeal to viewers’ sense of smell, suggesting that sculpture demands full-body awareness. Because the work has a shiny, silvery appearance; a cyclical form; and an integral relationship to the number 28, it is replete with lunar symbolism. Only one incense stick is lit at any time; the location of that stick changes on a daily basis over the course of a lunar cycle. This connects the work to our most local heavenly body, making it literally an “outdoor” sculpture, or a sculpture about the outdoors. Another sculpture, The Third Verse, which incorporates both abstraction and figuration, problematizes linearity in direct fashion. It is a highly frontal bronze object composed of small, elongated faces affixed to the ends of arm-like forms radiating outward, spoke-like, from a single nexus. This center is actually a circular frame positioned at the height of the viewer’s head so that it becomes a window, offering a point of reference in a simulation of infinite expansion. This perspectival emphasis also allows the work to be read as a three-dimensional line drawing, one whose graphic concision is offset by the beguiling (and beguiled) expressions on the faces that hover at the ends of its lines. Operating within the category of outdoor sculpture only accentuates the sophistication–and humor–that characterize Holloway’s project. 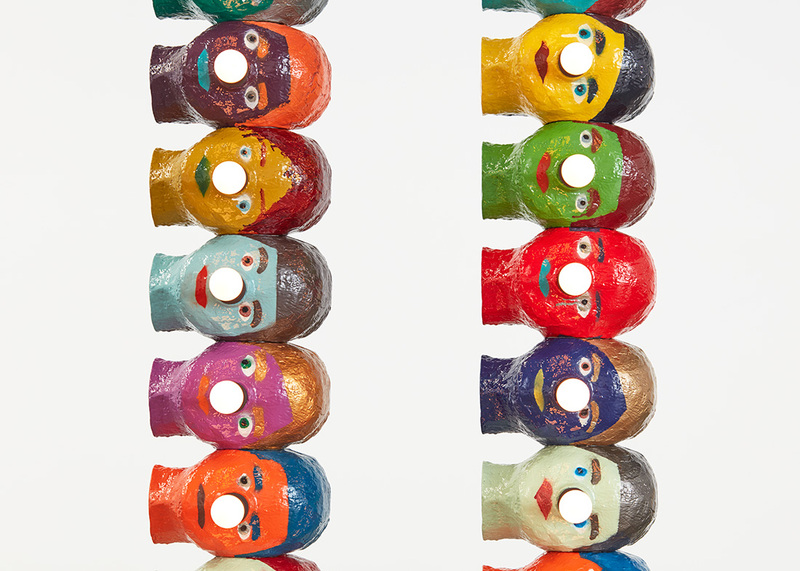 His aluminum columns of variously colored heads with working light bulbs for noses, for example, have been shown outside for many years. These genial, absurd totems also function as armatures for painterly compositions; the artist experiments with combinations of hue as well as the representational, if clownish, rendering of each individual face. 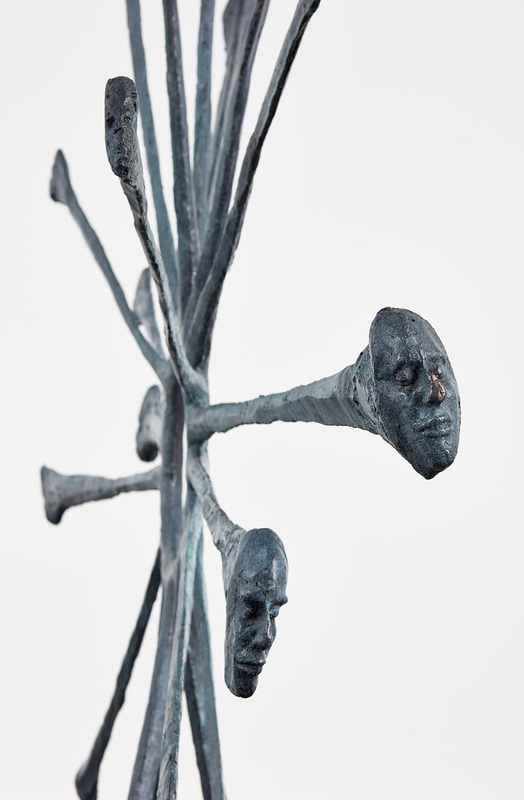 In Outdoor Sculpture, however, he introduces another layer of variation, presenting twin head stacks as a single work for the first time. The inherent seriality of this body of work therefore becomes even more pronounced, especially because the rows of bulbs in the two stacks flash according to the same pattern. As the only sculpture in the show with variegated color, not to mention electric light, it is a reminder that materiality takes many forms, and that not all of them are concerned with weight and mass. 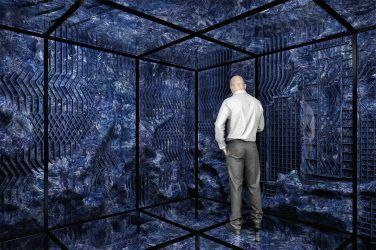 Similarly, the landscapes these forms inhabit (and will eventually inhabit) are not only physical–they are mental and metaphysical spaces too.